Krosschell is both grump (lamenting that his nephew is chatting on his cellphone about a bathroom renovation while at the top of picturesque Beech Hill) and sage, understanding that the world moves; times shift; and there’s a balance to be sought between society, with all its screens and buzzes, and nature. He celebrates the slow pleasures to be found scraping moss off the roof and asks the big questions about what kind of world is being left behind to younger generations. 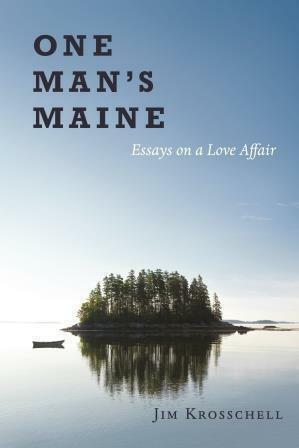 Like Loren Eiseley, he is an open-hearted scientist, one wedded to facts and yet not afraid to use the word “miracle” or “mystery.” The 16 essays appear in pairs — the first in each couple looks at Maine’s natural icons, berries, lupine, loon, lobster, and the second grapples with wider concerns. It is a view that will help even those who feel they know the state to see it anew. The first weekend of May brings the ninth annual Massachusetts Poetry Festival to Salem, this year gathering an impressive list of local and national poets including Louise Glück, Eileen Myles, Rigoberto González, Ross Gay, Kazim Ali, and Tom Sleigh. Besides readings, the festival will include a number of workshops, including “Obsessions: Using Form to Tame the Wild Beast in Poetry”; “Channeling the Witches: Giving Voice to Historical Figures through Poetry”; and “Your Pictures as Poetry — Writing from Your Photo Stream.” There will be panel discussions, including the essential “Arrows Dipped in Honey: How Poetry Hurts a Wounded World into Healing” with Boston Poet Laureate Danielle Legros Georges, Richard Cambridge, Regie Gibson, Deborah Leipziger, and Leah Meryl Harmon. The festival also includes a small press and literary fair, poetry slams, and open-air readings, with more than 150 poets involved. A weekend admission pass is $20, and a fee of $10 allows you access to all of the workshops. For a full schedule, visit masspoetry.org.